Gas sensors, controllers and warning devices from MSR-Electronic are “Made in Germany”. Due to various annual audits by TÜV, Dekra and major customers and because of various approvals and our own demand for top quality standards, the products are especially fail-safe (SIL2) and reliable. Perfectly tailored work processes for high quantities and 100 % final inspections ensure stable quality assurance. The most valuable asset for MSR-Electronic after our own employees is the certification (ATEX, UL, IECEx, EN50545, SIL2, etc.) of the products. Every year a considerable amount is invested in this field and ensures that customers can be certain that the products have also been extensively tested by a third party. MSR-Electronic has been very well known worldwide within and beyond the industry for many years. As the customers and distributors are spread all over the continents, the application purpose of the products has always been very different as well. This is exactly the reason why the experiences and customer requirements of the last 20 years have been continuously incorporated into all products. There is probably no other company in the field of fixed gas warning systems that can offer more product features than MSR-Electronic. Therefore, the company is also the technological market leader in this field. The new PolyGard2 and PolyXeta2 series in particular have been meticulously developed over many years, so that in the end no customer wish remains unfulfilled. MSR-Electronic has the right product for every application, every gas and every customer requirement. Thanks to the ingenious modular principle of the entire product range it is possible to cover nearly all applications and always to offer the ideal system. Large corporations are sometimes sluggish and entrenched in their rigid processes. Start-ups have too little experience and cannot produce high quantities with stable quality. MSR-Electronic has an ideal company size, so that special customer wishes can be implemented quickly and unbureaucratically - and in high quantities with constant quality. Large quantities are the fuel for more attractive prices in all industries. MSR-Electronic manufactures the products on assembly lines - partly fully automated. These high volumes enable stable processes to be introduced and components to be purchased more cheaply from suppliers - and MSR-Electronic passes this benefit on to its customers. Gas detection systems from MSR-Electronic are not always recognizable at first glance - many of the customers receive the products as OEM versions with their own company logo and sometimes also their own characteristics. Thus MSR-Electronic offers larger customers the opportunity to continue to present themselves as manufacturers in their market segment. 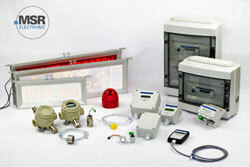 For more detailed information to the MSR-Electronic products visit our new webshop under www.msr-24.com.